I love finding wiggly twigs on my walks in the woods, but finding ways to use them that will set off their beauty is another matter. Here's one way that I thought of; salvaging baskets from the thrift store or garage sales gives you lots of great hypertufa molds - I line them with thin plastic film, and make the hypertufa pot inside it. These ones were a little different; I made a loop of two strands of wire and embedded it right in the hypertufa, so that the ends of the wire stuck out. 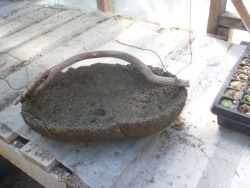 Then, once the pot is cured properly, I attach the twig to the pot with the two ends of wire. I don't know if this would stand up too well to being carried with the wire, but it sure is cute! 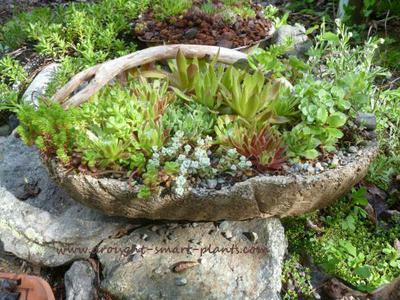 Plant with your choice of small hardy succulents like the many species and varieties of Sedum and Sempervivum that you most likely have available (if you're obsessed like me, and can't turn any down) and mulch with pea gravel, pumice or lava rock to keep the moisture in and the weeds down. You are an artist! Take a bow! 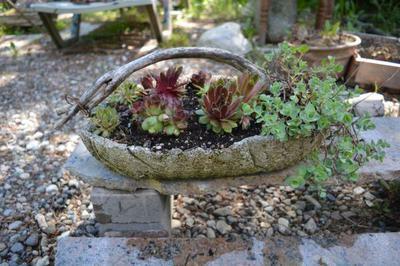 I have had an affair with creating hypertufa vessels for some time. 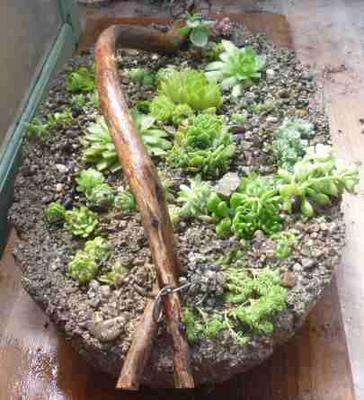 Adding an awesome twig handle adds style & charm times ten. Thank you sooooo much for sharing your idea. I can't wait to try something similar. I'll be in my greenhouse at the crack of dawn for sure! I made this a few years back - over four years now. 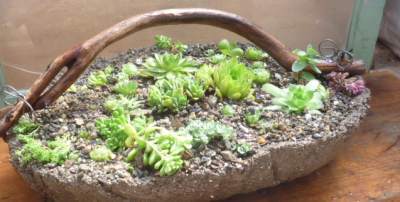 It has languished a bit, then I decided to make it pretty again, and took out the old soil from the middle of it, leaving the two ends which both had plants with life left in them. 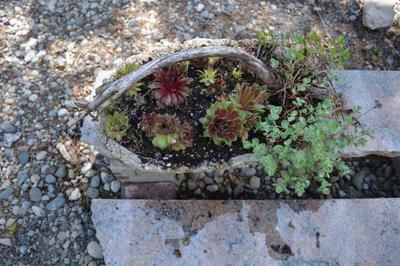 The new plants are NOID Sempervivum - those that are without a name or an identity. I get them making themselves at home in all kinds of odd places, and then they get popped into a planter to fill a gap, or even in my rock wall. These pictures show it newly planted - give it a few weeks of warm weather and sunshine, and the plants will get established quickly and fill in. 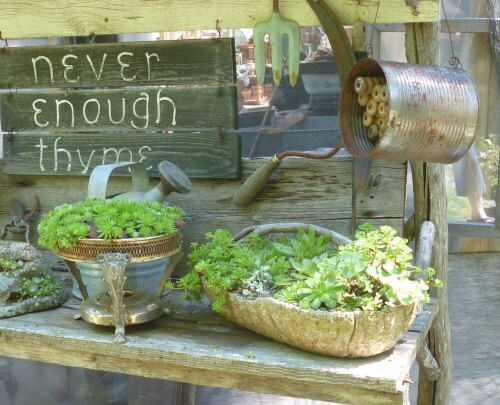 I never tire of finding new ways to display these great plants - this is one of many.